It’s time once again for holiday gift book buying. Here are this year’s selections for golfers of all types. Linda Valentine and Margie Hubbard did gambling golfers a favor with Golf Games Within The Game: 200 Fun Ways Players Can Add Variety and Challenge to Their Game, (Perigee Books, $11 SRP). It’s a good collection with surprising variety and well-written explanations of dozens of competitive formats. The book also includes the charts needed to play both Calloway System and Stableford tournaments. The inclusion of these two charts makes the book worth the modest price by itself. Daniel Wexler is a golf historian. In his new coffee table book, Missing Links: America’s Greatest Lost Golf Courses and Holes, (Sleeping Bear, $35 SRP), Wexler goes beyond the usual pretty pictures and adds some real substance. Each description of now-gone courses such as The Lido, Key West, or Oakland, uses a standard format. The overall layout, including yardages and par for each hole, is displayed by artwork and the occasional aerial photograph or scorecard. Plenty of other great old pictures, such as one of Bobby Cruikshank winning the 1927 Los Angeles Open at El Caballero, add to the history. Wexler describes how each course would likely play under today’s conditions, and gives insight into why some courses no longer exist. In Range Rats: How to Get Your Swing From the Practice Range to the Golf Course, (Woodford Press, $19.95 SRP), NBC golf analyst Roger Maltbie makes a good argument for taking the time to practice, rather than only trying to find your game during a weekly round. Helped by co-author Ron Salsig, Maltbie shows how a well-thought-out approach to practicing will pay off in the long run. The middle of the book also includes handy charts to help analyze each shot during a round, and also develop an individual practice plan. The Fundamentals of Hogan, (Sleeping Bear, $27.50 SRP), by David Leadbetter with Lorne Rubenstein, is a great supplement to Ben Hogan’s original classic of golf instruction, Five Lessons. The Hogan estate discovered several dozen photographs that Anthony Ravielli used to create the famous illustrations for Five Lessons. Leadbetter and Rubenstein make good use of the old photographs, along with new illustrations by Keith Witmer, a worthy successor to Ravielli. They then follow the same structure to explain, refine, and update Hogan’s approach to the golf swing. Caps off to the Hogan estate for making these pictures available, and to Rubenstein and Leadbetter for knowing how to enhance golf instruction with them. 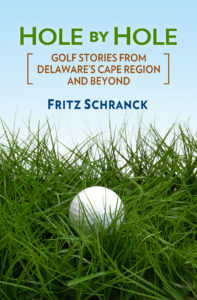 Chadds Ford, Pennsylvania resident Jeff Silverman compiled and annotated The First Chapbook for Golfers, (Woodford Press, $14.95). Chapbooks once were a very popular form of small publication, including bits and pieces on dozens of topics. Silverman put together a great little collection of all sorts of golf pieces. Short stories, instructional guides, architecture essays, psychological studies, and business articles fill the compilation. The book should help keep some good golf writing from fading into the past. Former CBS golf announcer Ben Wright is back. In Speak Wright: A literate guide to the game of golf, (Sleeping Bear, $18.00) Wright and Michael Patrick Shiels follow up their prior collaboration, Good Bounces & Bad Lies, with this witty collection of Wright’s not-so-stock golfing phrases. Each alphabetical listing includes a pithy explanation, with Wright’s distinctive tone well in evidence. For some readers, terms such as “Aquatic Doom” will bring Wright’s distinctive voice directly into their inner ears. This little book is fun for fans of wit, wordplay, and golf. Geoff Shackelford produced another beautiful coffee table book with Alister MacKenzie’s Cypress Point Club, (Sleeping Bear, $35 SRP). Shackelford, author of The Golden Age of Golf Design and editor of Masters of the Links, gained access to a fabulous collection of photographs of the famous club, taken before, during, and after construction of the enchanting layout. He combines the photographs with a well-written history. Essay subjects include the founding of the club, the retention of MacKenzie to do the design, its construction, and a hole-by-hole description. 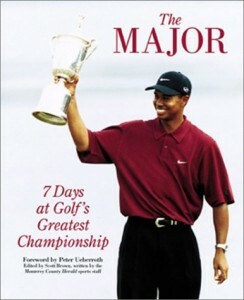 Fans of Tiger Woods, Pebble Beach, and the U.S. Open will love The Major: 7 days at Golf’s Greatest Championship, (Sleeping Bear, $37.50). Scott Brown and the Monterey County Herald sports staff put together what could be called a extended Sports Illustrated story on the 2000 Open. All the emotions that poured forth from that memorable major, from the Payne Stewart memorial service to Tiger’s record-setting performance, are captured in nice detail. The sportswriting in this book is equal to the photographs, a feat not often accomplished in a coffee table book. It’s a welcome exception to the general rule.